Craft & Clutter: Blast Off! Warm weather (50s) and sun, after 11 inches of snow last week, it feels like summer. Well, summer with a knit cap and jacket on. Being super productive and finishing, not one, but two projects in a week. Homemade Pizza with extra cheese. Grey's Anatomy and The Office being on the same night. Finding little people wooden pegs finally at Hobby Lobby. Getting a tour of the city by a friendly Craftster local. Only another day and my whole family can spend some quality time together. Being ready to start another thing. Podcasts, Harry Potter and crafting in subject, keeping me away from the tv and mostly the computer during the day. A book on breaking stupid US laws. Wists, which is the best way to shop without having money. The release of new Molly stuff. 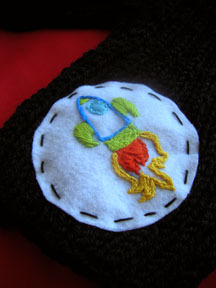 and of course, embroidered rocketships! This is a Flickr badge showing public photos from shuffar tagged with Craftiness. Make your own badge here.